What do the column headings mean? And how can I utilize the data? What are the buttons on the top of the dashboard? What does the bottom bar represent, & what does each button do? What do the filters do and how should I use them? Where can I find the Amazon Canonical URL? Q: What do the column headings mean? And how can I utilize the data? The following details will help you to better understand what each heading refers to, and what each button does. # = The position number where the product appears in the Amazon search results for the search you enterd. Your goal as a seller should be to become the number 1 position. Sponsored products will sometimes appear in the search results. They will be clearly labelled so that you know which are sponsored (paid advertising) verse an organic results. It is often said that paid ads is a good sign of a niche with enough profits to pay for traffic. Product = The exact title of the product in Amazon. Click on the heading to see this product in a new window in Amazon. In the Dashboard under the product heading, you will also see Brand & Category information. Brand = The brand (if any) registered to that product. Sellers = The number of New Sellers (and Used Sellers for the Dashboard) against this ASIN. Used sellers do not appear in this number count for the Extension. Add the search to your Dashboard to see this data. The higher the number of sellers, the greater the competition would be for the product's buy box. Fewer sellers would most likely mean less competition, but you would need to assess it against the estimated sales and revenue data or other additional market research. Variations = The number of product variations (also known as a child ASIN) this Parent ASIN has. If the number is 1, there is no variation of this product. It will have 1 ASIN only, and no child variations. Product variations are also an indication of the number of SKU's a product has. The higher the number of SKU's the more inventory heavy this product is. Price = The listed price of the item is sold at. Where there are multiple sellers this cell collects the data of the current seller in the buy box. Category = The main high level category which the product can be found. Rank = Amazon Best Seller Rank (BSR). Est. Sales = Monthly estimated sales. Monthly estimated sales are calculated off a combination of data relating to the BSR and our own collection of benchmarked historical sales data. Our sales data is growing and improving each day as we collect more and more sales data from our flagship product AMZ Tracker. Use this data as a guide when doing the market research for costings for your product. Est. Revenue = Monthly estimated revenue. Monthly estimated revenues are calculated off a combination of data relating to the Price in Amazon at that time multiplied by the number of estimated sales. Reviews = Number of reviews the product has. The figure includes any reviews left against the product, verified or not. Higher review numbers mean that it will be harder to start competing with this seller as a new seller. Rating = The Amazon Star Rating (1-5) given to the product. Amazon calculates a product’s star rating based on its own model (instead of a raw data average) which takes into account factors such as: the age of a review, helpfulness votes by customers, and whether the reviews are from verified purchases. FBA = The type of shipping the seller has. Where there are multiple sellers this cell collects the data of the current seller in the buy box. AMZ = Amazon is the seller and distributor. - = Fulfilled by merchant. Note: All data is current as at the time of when it was analyzed. If you wish to see the updated data you will need to 'refresh' the search results. Q: What are the buttons on the top of the dashboard? Click the 'star' if you wish to add this search to your favorites. The keyword (or phrase) used in this search result. Remember we don't use any selected 'Category' when doing this search. The date and time of the last data extract for this search. Click 'Refresh' if you want to re-analyze the data search. Click 'ADD TO DASHBOARD' if you want to save this search result data into the main Unicorn Smasher Dashboard. Click 'DASHBOARD' to go your Unicorn Smasher Dashboard. To close the extension window click on the 'X'. If you're not already an AMZ Tracker customer then click here to find out how we can help Skyrocket your sales in Amazon! Q: What does the bottom bar represent, & what does each button do? The number of search results found on the first page. Average estimated sales per month. Average estimated revenue per month. Click on 'NEXT PAGE' to see additional search results. Click on 'FILTER' if you wish to filter your search result. See more on the filters below. Click on the AMZ Tracker logo to learn more about us and our supplementary software. Click 'TO CSV' if you wish to export the search result data. The CSV file can be imported into any spreadsheet program. See more about this feature here. Click on 'HELP CENTER' to be directed to the Unicorn Smasher Help Center. Click the 'arrow' to hide sidebar. KEEP FAVORITES - This will clear everything apart from your favourites. CLEAR ALL - This will clear all of your research history. CREATE SHAREABLE IMAGE - Click here to see an image of the data - you can highlight certain rows and download the final image by click 'download '. See more about this feature here. Q: What do the filters do and how should I use them? 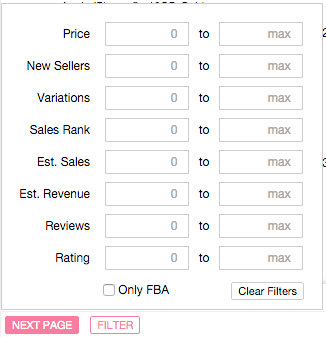 You can add a minimum or a maximum value for each field. As well as setting both. Narrow down the data to see how competitive a niche is, see who else is at the same level you would want to compete in and weigh up the viability of the niche. Q: Where can I find the Amazon Canonical URL? What is a canonical URL? Basically, Amazon takes the first 7-8 words from your product title and will include a handful of them in the products official URL. With the Unicorn Smasher Chrome extension you can quickly spy on your competition, to see how well their products are optimized, and research what keywords are being used in each canonical URL. We recommend that you take advantage of this tool to also optimize your own canonical URL's, by adjusting your product title, until Amazon picks up your best keywords.